The Badger Poll gives Bush a 4-point lead in Wisconsin. In Pennsylvania there is a Quinnipiac University poll and a Fox News poll. As we recently pointed out, the Fox polls seem to be biased in favor of Bush, and sure enough, Bush has a 3-point lead in their survey while Quinnipiac puts Kerry ahead by 1 point. We averaged them and put Bush ahead in PA by 2 points. As a consequence, the electoral vote is now exactly tied at 269 to 269. If the final election comes down to 269 to 269, the likely consequences are as follows. First, both candidates will look carefully for potential faithless electors, that is, electors who can be persuaded to vote for the candidate they are not pledged to. Offering cash in trade for a vote might be illegal in some states, but there might be subtle questions like: "If I were president, is there anything I might be able to do to help you in some way? Government contracts, government jobs, you name it? Everything would be on the table. It would make Florida 2000 look like a model of good government. 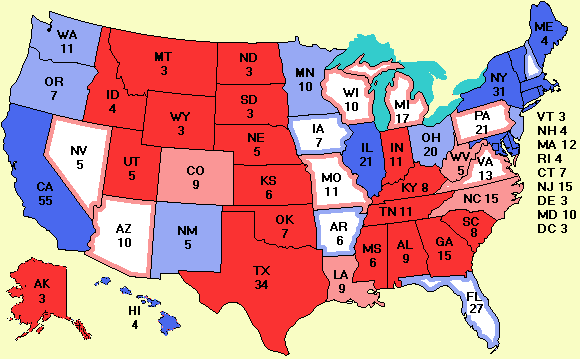 If no elector changed his or her mind, the election would be thrown into the newly-elected House of Representatives with each state having one vote. Presumably the representatives would vote a straight party line. A state with an evenly-divided delegation would lose its vote. If the House vote came down to an exact tie, that's when it would start to get real hairy. And the Republicans might ask the Supreme Court to put in their two cents worth again. It's anyone's guess what would happen then.